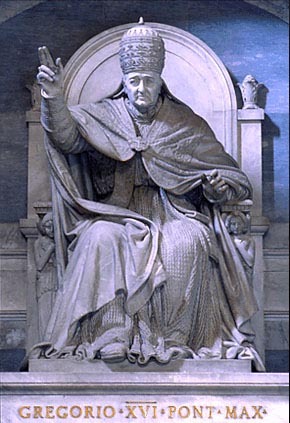 Gregory XVI was the last monk to be elected pope. 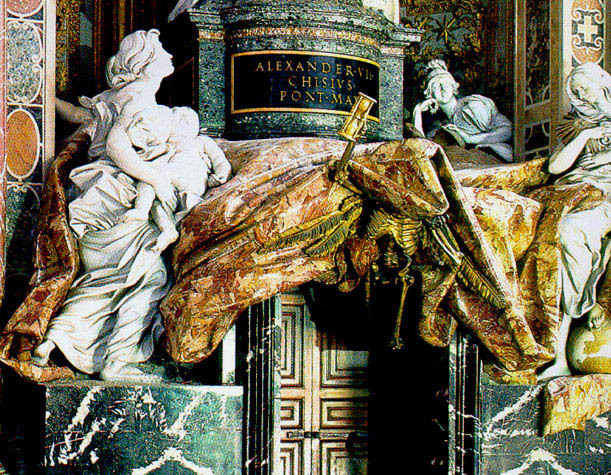 The bas-relief on the urn portrays the Institution of the Missions by the Pontiff. The two allegorical lateral figures represent Wisdom (head crowned by a flame) and Prudence (with a mirror and a snake). 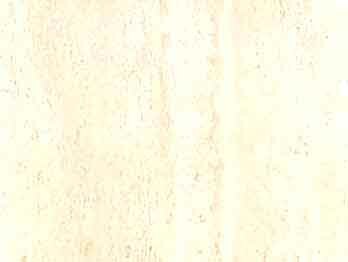 On the base there is a door leading to the Chapel of the Blessed Sacrament. 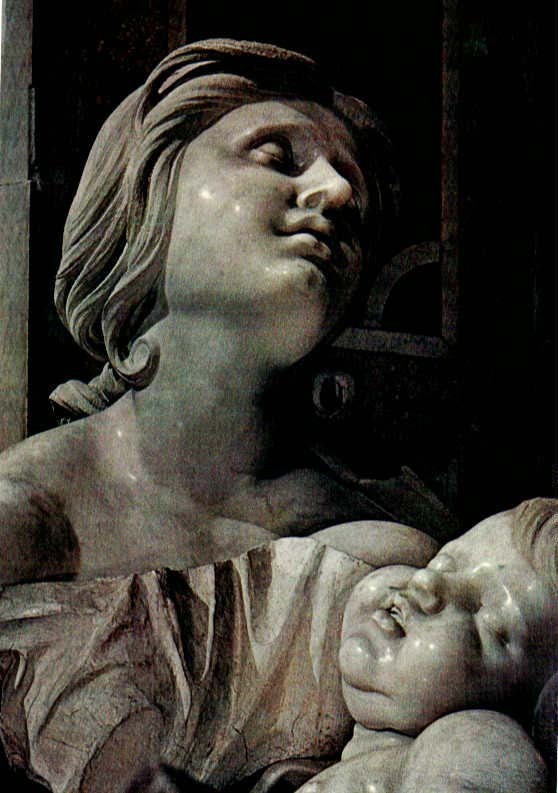 The monument is clearly inspired by Canova, with noteworthy though not very satisfactory results, especially with regard to the general composition, which is rather incoherent and monotonous in its linear arrangement. 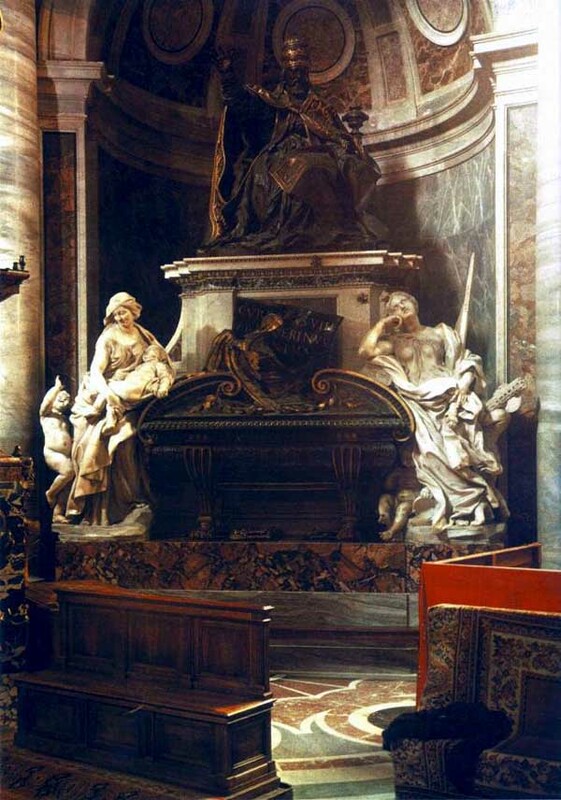 The Pope, in the act of blessing, is at the top, seated on a throne, which in turn is located on a base that rises over the sarcophagus. Above the sarcophagus a bas-relief depicts a scene referring to the propagation of the Faith, assiduously supported by Pope Gregory XVI with the institution of the Catholic Missions (as a Cardinal he was the Prefect of the Holy Congregation for Propagating the Faith). There are two symbolic figures on the sides representing Knowledge, with the head crowned by a flame, and Prudence, with the features of the mirror and the snake; works with a classical style, because of the meticulousness and technical skill, even if a bit frozen due to an excessively Neoclassical style. A Camaldolese monk (and the last monk to be elected Pope), Gregory XVI was one of the Church's most reactionary popes, employing Austrian troops on two occasions to crush uprisings in the Papal States and opposing Italian nationalism, freedom of conscience, freedom of the press, and the separation of Church and state. At the same time, he was a strong promoter of the missions. 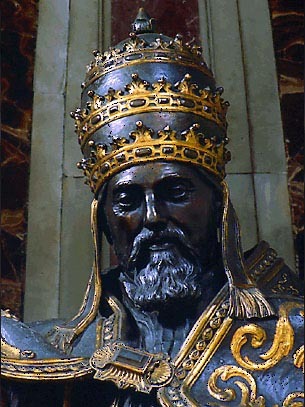 Gregory XVI founded the Etruscan and Egyptian museums in the Vatican and the Christian museum in the Lateran. By the end of this pontificate, however, the papal treasury had been depleted because of all the military expenditures to maintain order in the Papal States. 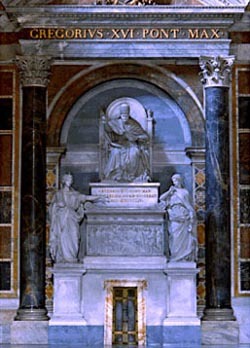 He was buried in St. Peter's, first in the crypt and then, in 1853, in the basilica proper, with a monument done by Luigi Amici (1817-1887) and funded by the cardinals Gregory XVI had created during his pontificate. 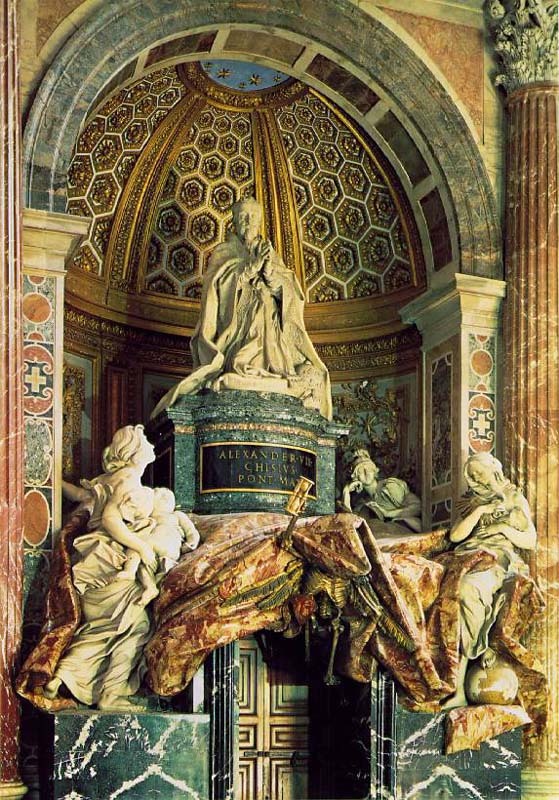 During his reign the losses of the Church in Europe were more than balanced by her gains in the rest of the world. Gregory sent missionaries to Abyssinia, to India, to China, to Polynesia, to the North American Indians. He doubled the number of Vicars-Apostolic in England, he increased greatly the number of bishops in the United States. During his reign five saints were canonized, thirty-three servants of God declared Blessed, many new orders were founded or supported, the devotion of the faithful to the Immaculate Mother of God increased. In private as in public life, Gregory was noted for his piety, his kindliness, his simplicity, his firm friendship. 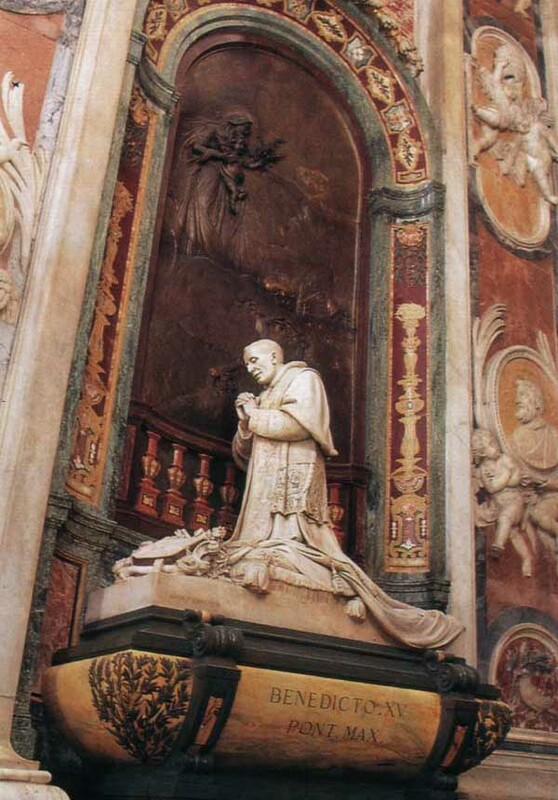 He was not, perhaps, a great pope, or fully able to cope with the complicated problems of his time, but to his devotion, his munificence, and his labours Rome and the Universal Church are indebted for many benefits.